Blog Not all clicks are equal when it comes to customer acquisition. 3 reasons why advertisers need to lead with email. Email is having a moment. Numerous research studies (including research from the Direct Marketing Association) and marketing press opinion (including The Drum) back up the fact that consumers are turning back to “renaissance” channels like Direct Mail and email, which drive a high level of consumer trust and engagement. In a world of carpet-bombing display and programmatic advertising tactics, it’s easy to see why. 1) It’s become the single most important piece of data to unlock an accurate picture of an individual consumer, a verifiable digital “fingerprint”. The email is the only piece of data that connects together all other online data generated by an individual, to reveal a true single customer view, with no blind spots. As the DMA puts it “While phone numbers and addresses are important to marketers, the central point of contact has coalesced around the email address.”. It’s also the consumer’s own most trusted digital identifier, the one piece of deterministic data we all rely on, almost without exception. It’s so important you can’t open a bank account, get a mortgage, or even complete an online shop, without one. 2) Email delivers reach and scale that no other channel can get close to. It’s a fact that more people can be reached by email than any other channel. 87% of the UK’s 65 million population (56 million) have an active email address, and more than 60% of these check their email 1-4 times per day. Contrast this to the channel with the next highest reach, social media, which reaches 59% of the population (38 million). Plus, email addresses tend to be stable for longer, with the average primary email address in active use for 10 years, versus postal addresses for example, which change much more frequently. 3) Email packs a punch on multiple marketing metrics, not just ROI. Setting aside a straight numbers comparison for a minute, all clicks are not equal. 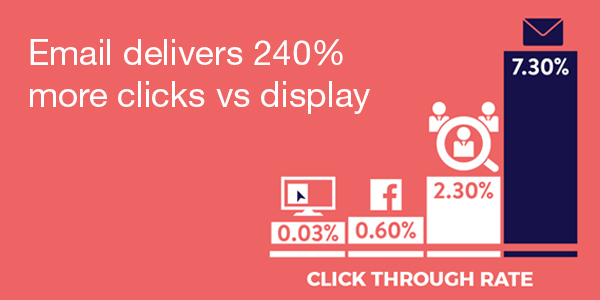 Different channels offer clicks of different relative value, depending on your objectives. Search is certainly highly effective in generating a high volume of leads (albeit less qualified), and display advertising has an important role to play in raising awareness of any brand. However, email offers a significantly higher click to conversion rate, due to the fact that consumers are more engaged with a brand they have opted in to receive advertising messages from. Email leads are also likely to be better-qualified leads because the longer email format allows for a greater level of qualification. Plus, email is the top preferred channel to receive offers from brands by 74% of consumers, so offers delivered by email are going to reach a more receptive audience. So email delivers on ROI, reach, and relevance, and gives advertisers the ability to increase customer engagement through targeting individuals based on an accurate understanding of their unique preferences and behaviours – not just their (often misleading) cookie trail. The email channel has innovated beyond recognition, and advertisers are waking up to the benefits of an email powered customer acquisition programmes.